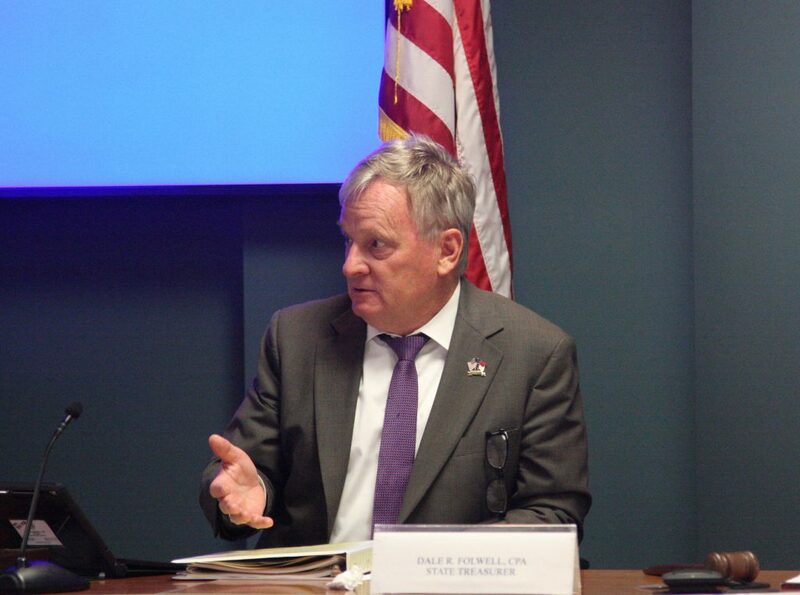 A plan by State Treasurer Dale Folwell to reform the nearly insolvent State Health Plan faces legislative pushback, prodded by hospitals and large medical providers. Folwell has no plan to abandon the reforms, which actuaries say would prevent the plan from going broke within four years. But House Bill 184 would force Folwell to drop those changes — even though the law would cost the state hundreds of millions of dollars, and plunge the plan’s unfunded liabilities $1 billion deeper into the red. Those projections came from a just-released legislative fiscal note attached to H.B. 184. It’s the latest development in a bruising battle pitting the treasurer and State Employees Association of North Carolina against the state’s biggest players in the health care market and some sympathetic lawmakers. The State Health Plan’s actuary says Folwell’s changes would avoid $486 million in extra health plan costs through fiscal year 2021-22, and an extra $1.1 billion in unfunded liabilities. The General Assembly’s actuary puts the additional claims costs at $534 million, and pegs new unfunded liabilities at $1 billion. The self-funded State Health Plan represents more than 720,000 state employees and retirees, and spends $3.3 billion a year. It is the largest health-care buyer in the state. But is one of the worst-funded public health plans in the nation. It has 3 percent of the funding it needs to cover projected future expenses, with $35 billion in unfunded liabilities. By 2023, it won’t have enough money to pay its bills. Folwell hopes to launch his Clear Pricing Project in January 2020, requiring health care providers to publish their prices. Letting health care consumers price shop would spark competition and reduce costs. The reference-based pricing model ties payments to Medicare rates, and builds in a profit margin for providers. It would bring uniformity and certainty to the current payment structure in which hospitals charge widely differing prices, some as much as 800 percent above cost. Hospitals and their lobbying arm at the N.C. Healthcare Association say Folwell’s plan would cut revenues $450 million, equivalent to an average 15 percent of members’ budgets. Partners for Innovation in Healthcare, a 501(c)4 independent expenditure organization, has launched a war of words against Folwell on Twitter, and a blistering advertising campaign. In another Tweet it attacks “the labor union bosses at SEANC” as disinterested in reforming and modernizing the State Health Plan. “Those unions who want to mandate non-negotiated rates for healthcare are driving toward state run healthcare. If you don’t want your healthcare socialized and rationed then ask your legislators to pass H184,” N.C. Healthcare Association Vice President Cody Hand said on Twitter. H.B. 184 would create a study committee to examine State Health Plan needs. It mandates continuing the current arrangement with third party administrator Blue Cross and Blue Shield of North Carolina until the end of 2021. Folwell wants Blue Cross NC to provide a less expensive, more transparent plan instead. Primary sponsors of H.B. 184 received notable political contributions from the N.C. Healthcare Association in 2018: Reps. Josh Dobson, R-McDowell, $5,200; Julia Howard, R-Davie, $2,000; William Brisson, D-Bladen, $3,000; and Gale Adcock, D-Wake, $6,200. Partners for Innovation in Healthcare publicly thanked them for sponsoring the bill. Julie Henry, N.C. Healthcare Association spokeswoman, insists her organization is separate from Partners for Innovation in Healthcare. “It is supported by some of our health systems, but the intention is to provide a way for people other than hospitals to get involved in the conversation about health care because it does affect everybody,” Henry said. The entities share many health care concerns, but none is more important than blocking Folwell’s changes, she said. Hospitals began talking to H.B. 184 sponsors last fall about the bill. Folwell told a legislative committee earlier this year his reforms would proceed unless the General Assembly passed a law blocking him. Folwell recently increased health care provider reimbursements to 82 percent above Medicare rates. Rural health providers would get 20 percent more than in his original proposal. Taxpayers still would save almost $258 million, and State Health Plan members almost $57 million in out-of-pocket costs yearly. Some hospitals would receive more money under his reform. Folwell said the adjustment expands the number of rural facilities benefiting from 20 to 70. His office is talking to hospitals about bundling payments and creating Accountable Care Organizations. “He does appear to be hearing the concerns about the impacts on rural communities, but there’s not a lot of specifics behind his proposal,” Henry said. Folwell still relies too heavily on cutting rates as a short-term goal, while ignoring long-term ways to improve health care and reduce more expensive hospital visits. She said hospitals aren’t completely dismissing Folwell’s efforts. “It’s really saying there’s a better way to go about accomplishing this goal, and we’d like to be a part of a solution as opposed to having a solution thrust upon us,” Henry said. Folwell is unhappy with legislative action intruding on the State Health Plan’s Board of Trustees’ unanimous decision to adopt his Clear Pricing Project. He said neither House party caucus has invited him to discuss his plan. “All we have to offer to the members of the legislature is good government. We can’t contribute to them, or send them places,” or compete with the hospitals’ large team of lobbyists, he said. He noted the General Assembly control of the State Health Plan to the treasurer while he was still in the General Assembly. Lawmakers recognized they had neither the time nor expertise to manage the huge, complicated system. Under legislative oversight, the plan was down to three days of operating reserves, and would have been shut down by regulators if it were an insurance company, he said. He says claims he’d cause hospitals to close are off base. “I’ve never closed one hospital in my life. We’re trying to keep hospitals open, and independent, and profitable,” Folwell said. “They’re the ones closing hospitals.” The N.C. Rural Health Research Program lists six hospital closures since 2010, the most recent being Washington County Hospital in Plymouth on Feb. 14. He brushed off political and personal attacks, saying he also took heat as a lawmaker championing worker’s compensation reform, and as a Commerce Department assistant secretary turning $2.5 billion in federal unemployment insurance debt into a surplus. He attributes the criticism to hospitals’ objection to transparent pricing. They refuse to relinquish the power to dictate payments no other vendor in state government enjoys.